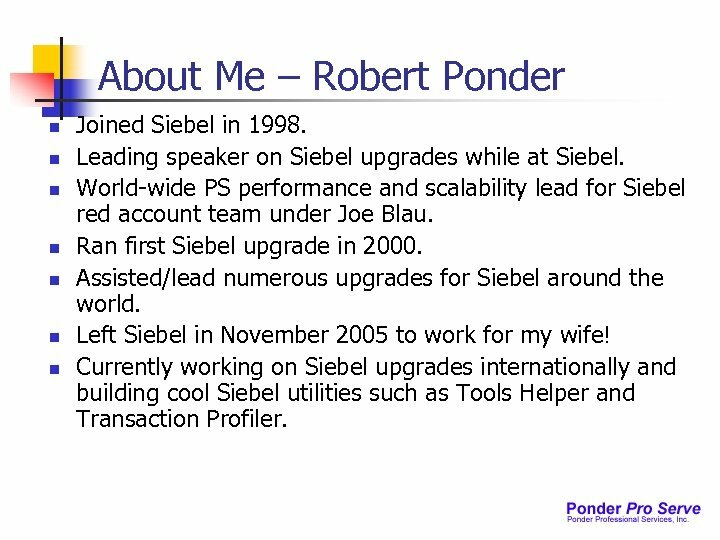 About Me – Robert Ponder n n n n Joined Siebel in 1998. 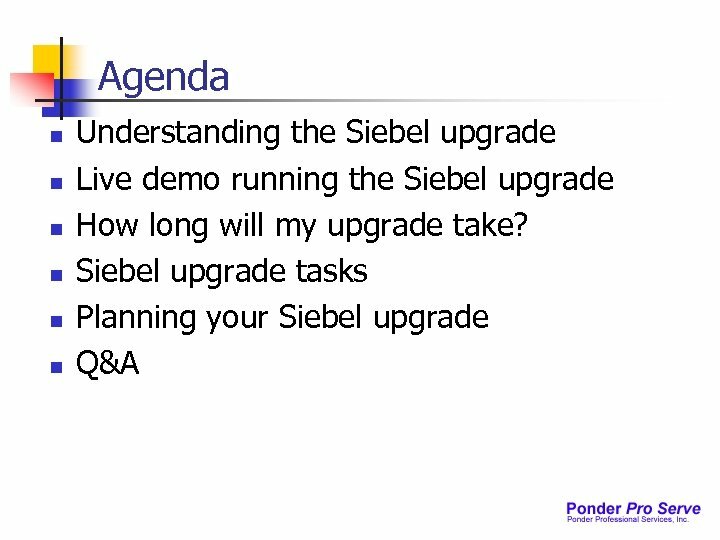 Leading speaker on Siebel upgrades while at Siebel. World-wide PS performance and scalability lead for Siebel red account team under Joe Blau. 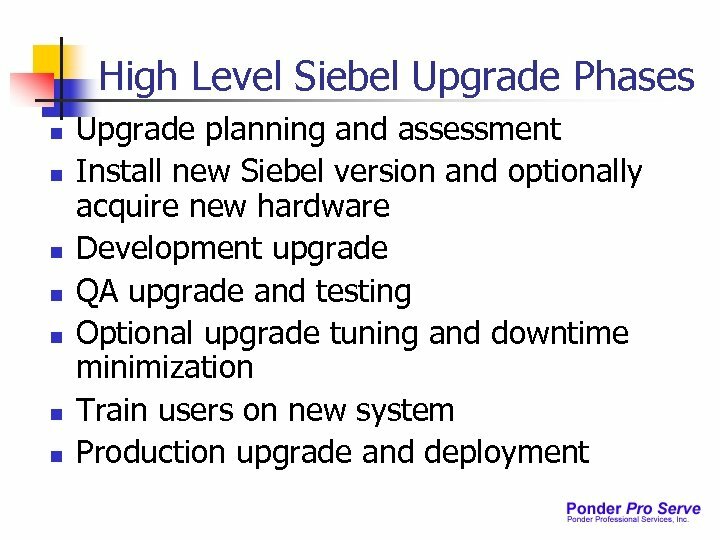 Ran first Siebel upgrade in 2000. 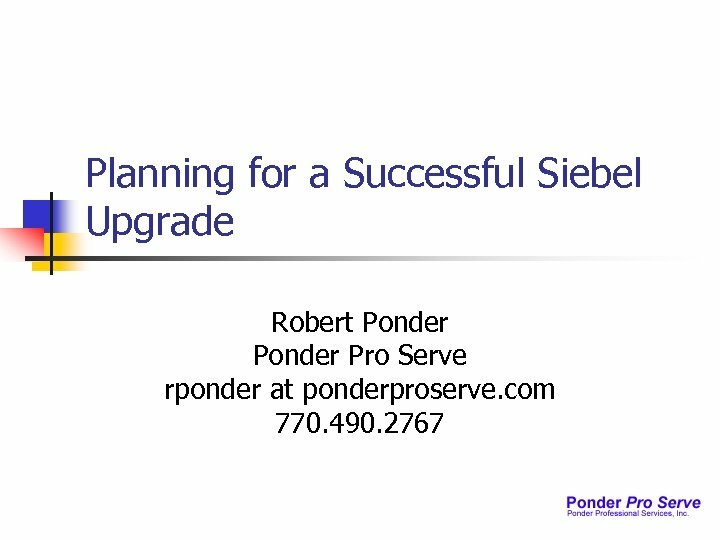 Assisted/lead numerous upgrades for Siebel around the world. Left Siebel in November 2005 to work for my wife! Currently working on Siebel upgrades internationally and building cool Siebel utilities such as Tools Helper and Transaction Profiler. 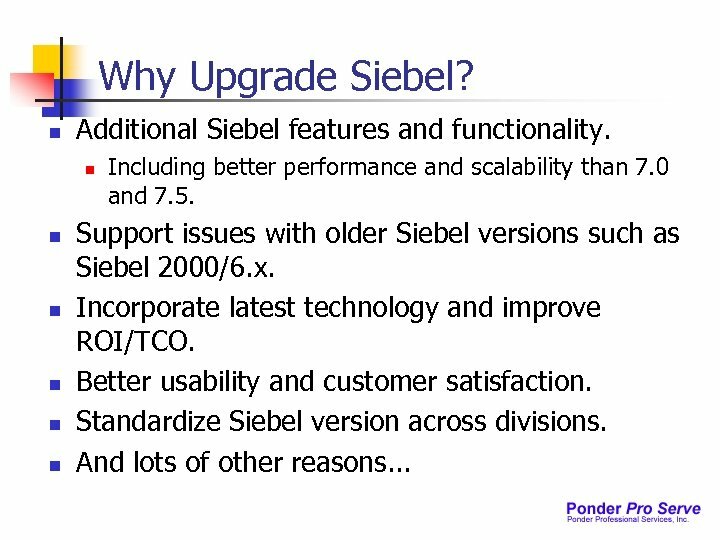 Why Upgrade Siebel? n Additional Siebel features and functionality. n n n Including better performance and scalability than 7. 0 and 7. 5. Support issues with older Siebel versions such as Siebel 2000/6. x. 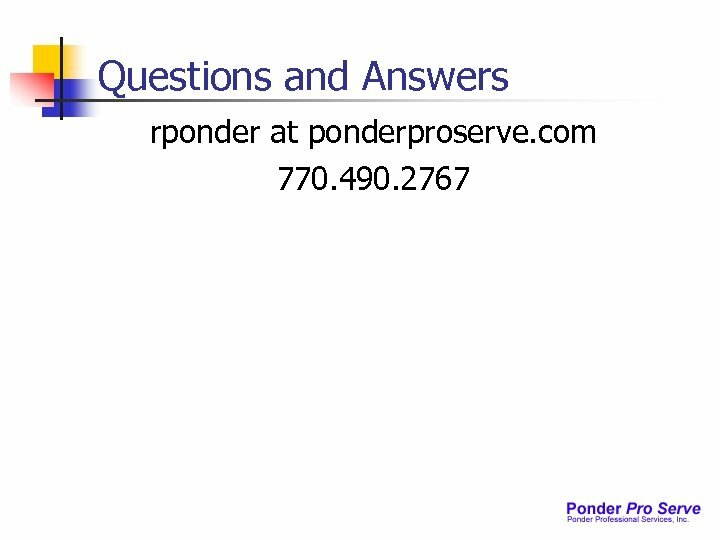 Incorporate latest technology and improve ROI/TCO. Better usability and customer satisfaction. Standardize Siebel version across divisions. And lots of other reasons. . .
Upgrade or Reimplement? n n n Some people may tell you to reimplement instead of upgrade. We have yet to see a single case where reimplementing was not a mistake and consider this practice an antipattern. Originated when inexperienced teams upgraded from 6 to 7 and the upgrade was painful. Ignores the fact that most customers really do need their customizations. Often customers feel like their original implementation could have been better so they like the idea of being able to redo it. Favored by some system integrators because reimplementing means there will be analysis and design phases which are minimized/skipped on upgrade projects. 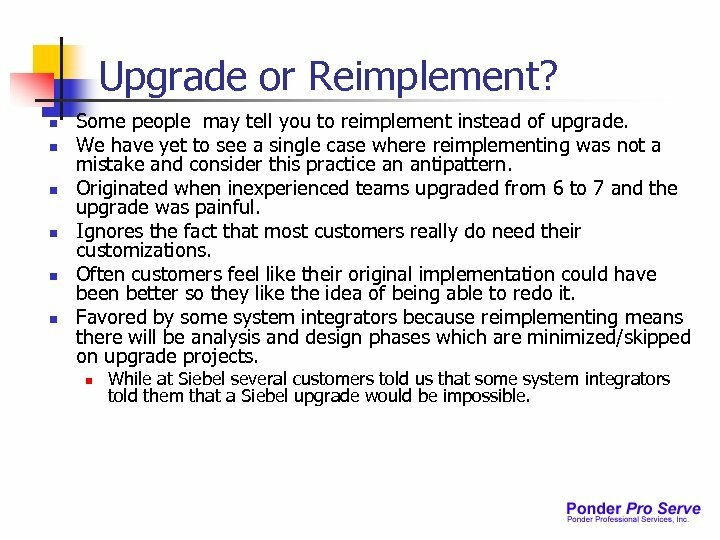 n While at Siebel several customers told us that some system integrators told them that a Siebel upgrade would be impossible. Reimplementation Example n n n Compare to a 4 month 6 -> 7. 7 upgrade that was a very similar implementation. 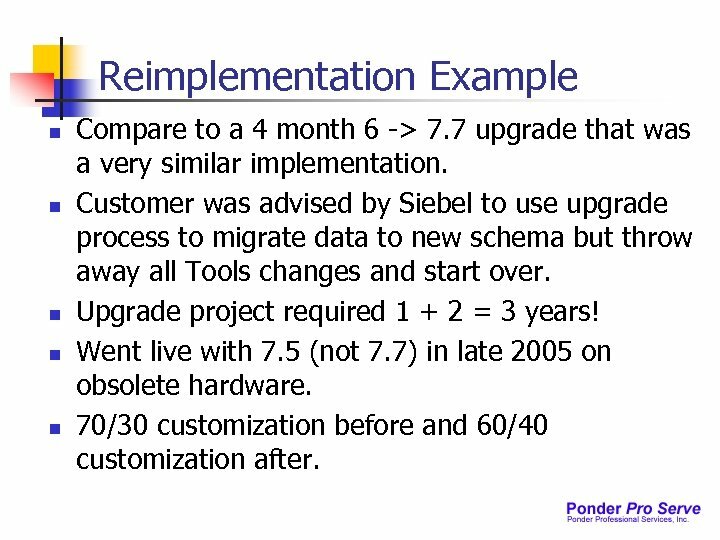 Customer was advised by Siebel to use upgrade process to migrate data to new schema but throw away all Tools changes and start over. Upgrade project required 1 + 2 = 3 years! Went live with 7. 5 (not 7. 7) in late 2005 on obsolete hardware. 70/30 customization before and 60/40 customization after. Upgrade Example - Demo System n n n Demo system said to be minimally configured with just a little data in database. We thought we had found our first case where we would be better off installing a new instance instead of upgrading and reentering the sample data. Began researching on Monday and by Tuesday realized there weeks of customizations and lots of custom data. n n Two-step upgrade from SEA 7. 5 to SIA 7. 7 started Tuesday night and we had a mostly runnable application by Friday. 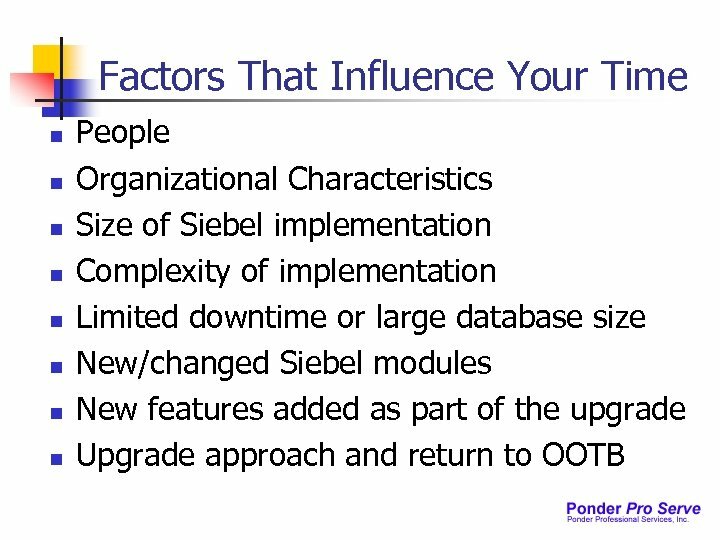 n n Point: We tend to forget about all the hard work put into configuring Siebel. Results not typical – very strong 3 person team. 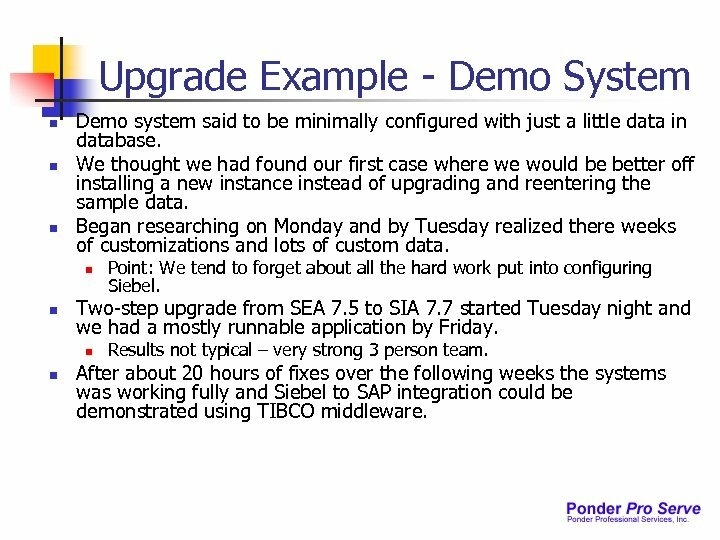 After about 20 hours of fixes over the following weeks the systems was working fully and Siebel to SAP integration could be demonstrated using TIBCO middleware. Reimplementation/Upgrade Flowchart n Do you need the data in your Siebel database? n n Do you need the new data elements you added to the Siebel schema such as extension tables and columns? 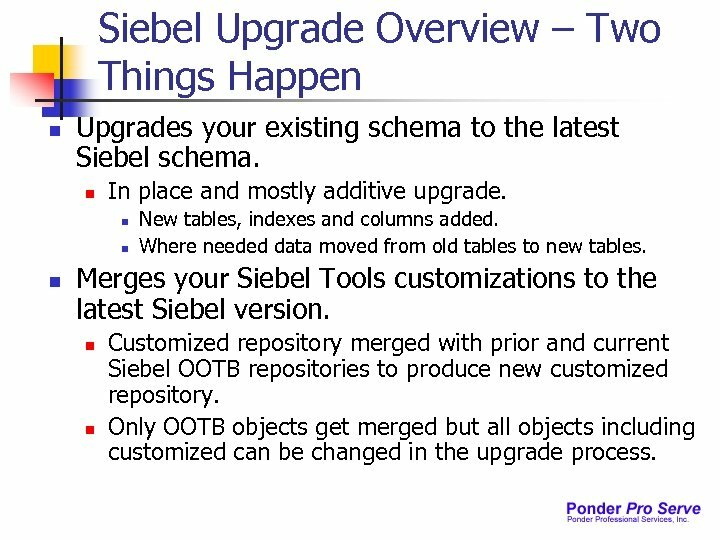 n n If yes then let the Siebel upgrade (Tools merge) migrate your schema extensions to the new Siebel version. Do you need these data elements shown on the Siebel UI? 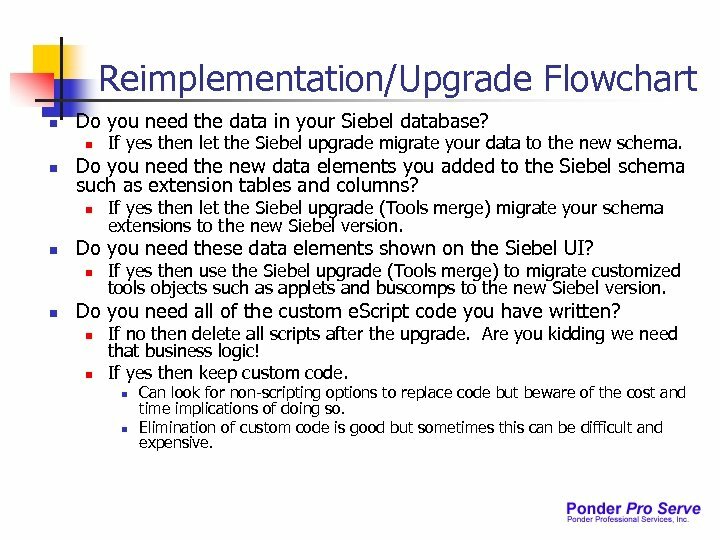 n n If yes then let the Siebel upgrade migrate your data to the new schema. If yes then use the Siebel upgrade (Tools merge) to migrate customized tools objects such as applets and buscomps to the new Siebel version. Do you need all of the custom e. Script code you have written? n n If no then delete all scripts after the upgrade. Are you kidding we need that business logic! If yes then keep custom code. n n Can look for non-scripting options to replace code but beware of the cost and time implications of doing so. Elimination of custom code is good but sometimes this can be difficult and expensive. Going Back To OOTB vs. New Free Features n n Going back to OOTB can carry a high price tag so be careful when you say you want to go back to OOTB as part of your upgrade. Examples where OOTB features replaced customizations: n n n Replaced e. Script audit trail with Siebel 7. 5 audit trail about $10 K Replaced complex e. Script assignment manager with Siebel 7. 8 Assignment Manager about $175 K (20% of upgrade budget) 7. 7/7. 8 native browser back/forward buttons, automatic saving of file attachments and other features are free. During planning when you look for opportunities to return to OOTB don’t be surprised when you can’t identify many places where you can actually remove your customizations. What is the cost/benefit of replacing e. Script business rules with the 7. 8 business rules engine or the new 8. 0 Haley rule engine? What if the rules changed a lot vs. were static? 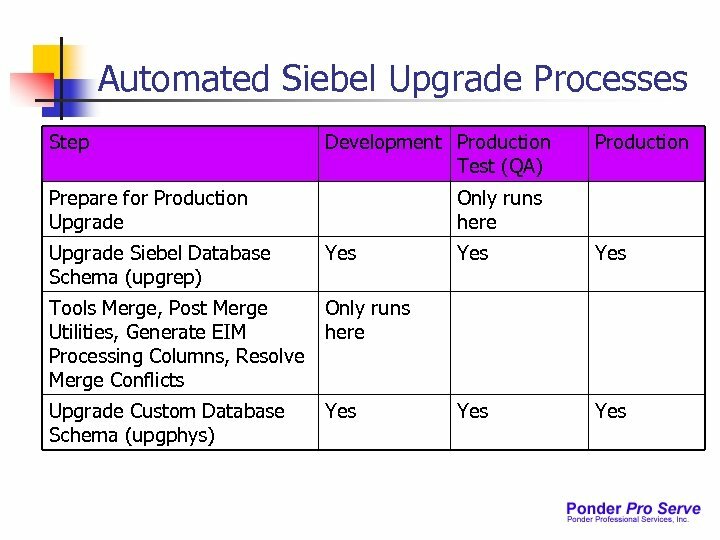 Siebel Upgrade Overview – Two Things Happen n Upgrades your existing schema to the latest Siebel schema. n In place and mostly additive upgrade. n n n New tables, indexes and columns added. Where needed data moved from old tables to new tables. Merges your Siebel Tools customizations to the latest Siebel version. n n Customized repository merged with prior and current Siebel OOTB repositories to produce new customized repository. Only OOTB objects get merged but all objects including customized can be changed in the upgrade process. 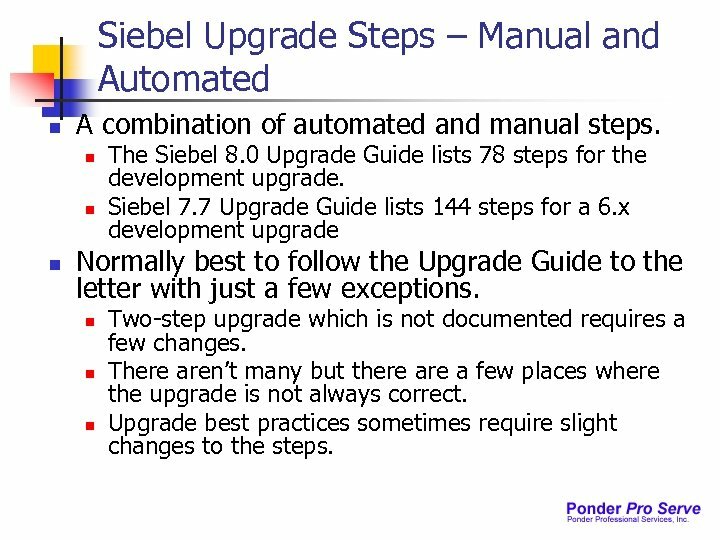 Siebel Upgrade Steps – Manual and Automated n A combination of automated and manual steps. n n n The Siebel 8. 0 Upgrade Guide lists 78 steps for the development upgrade. Siebel 7. 7 Upgrade Guide lists 144 steps for a 6. x development upgrade Normally best to follow the Upgrade Guide to the letter with just a few exceptions. n n n Two-step upgrade which is not documented requires a few changes. There aren’t many but there a few places where the upgrade is not always correct. 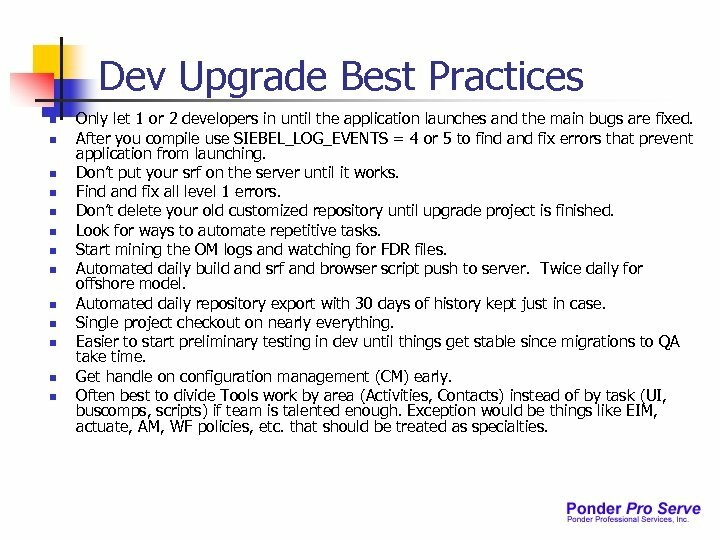 Upgrade best practices sometimes require slight changes to the steps. 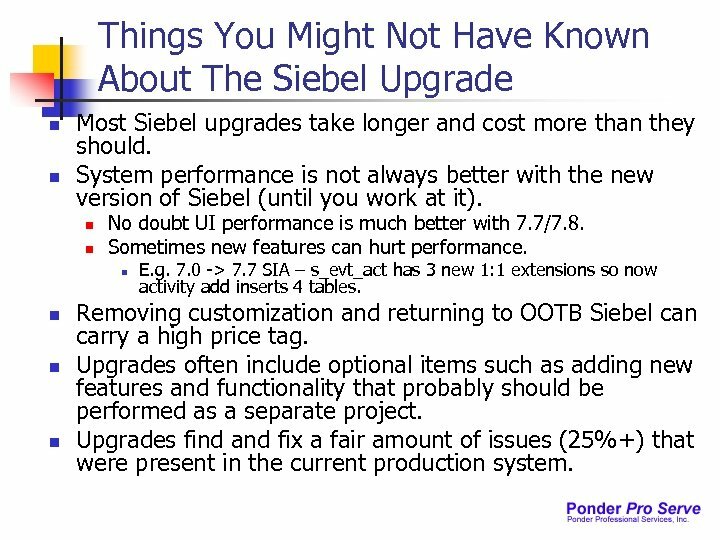 Things You Might Not Have Known About The Siebel Upgrade n n Most Siebel upgrades take longer and cost more than they should. System performance is not always better with the new version of Siebel (until you work at it). n n No doubt UI performance is much better with 7. 7/7. 8. Sometimes new features can hurt performance. n n E. g. 7. 0 -> 7. 7 SIA – s_evt_act has 3 new 1: 1 extensions so now activity add inserts 4 tables. 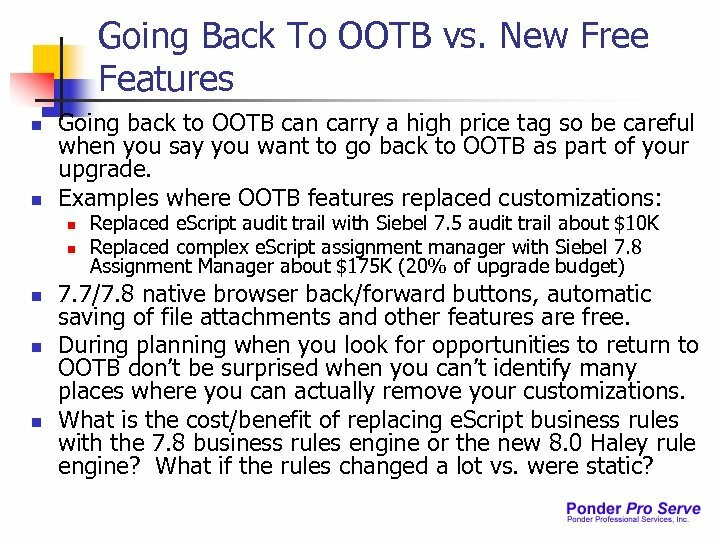 Removing customization and returning to OOTB Siebel can carry a high price tag. 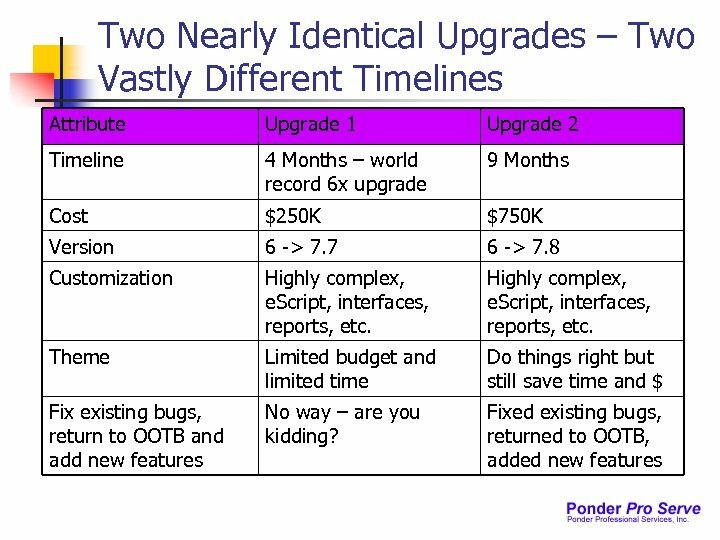 Upgrades often include optional items such as adding new features and functionality that probably should be performed as a separate project. Upgrades find and fix a fair amount of issues (25%+) that were present in the current production system. How Long Will My Upgrade Take? 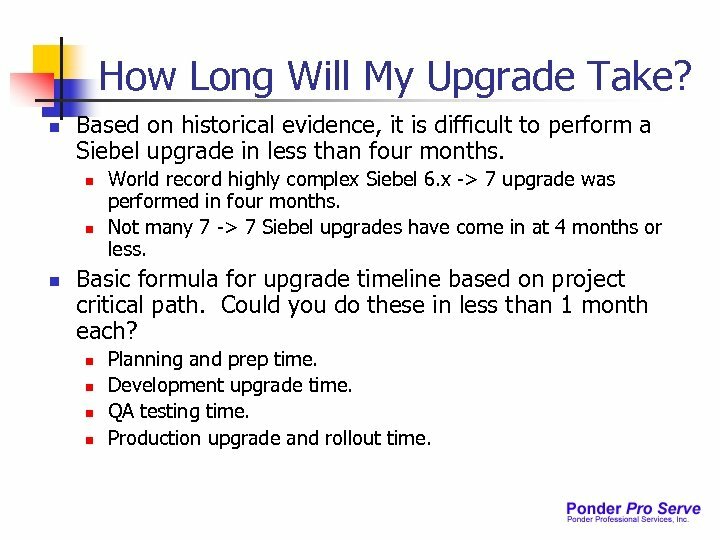 n Based on historical evidence, it is difficult to perform a Siebel upgrade in less than four months. n n n World record highly complex Siebel 6. x -> 7 upgrade was performed in four months. Not many 7 -> 7 Siebel upgrades have come in at 4 months or less. Basic formula for upgrade timeline based on project critical path. Could you do these in less than 1 month each? n n Planning and prep time. Development upgrade time. QA testing time. Production upgrade and rollout time. Upgrade Planning n n Minimum of four weeks of planning recommended. 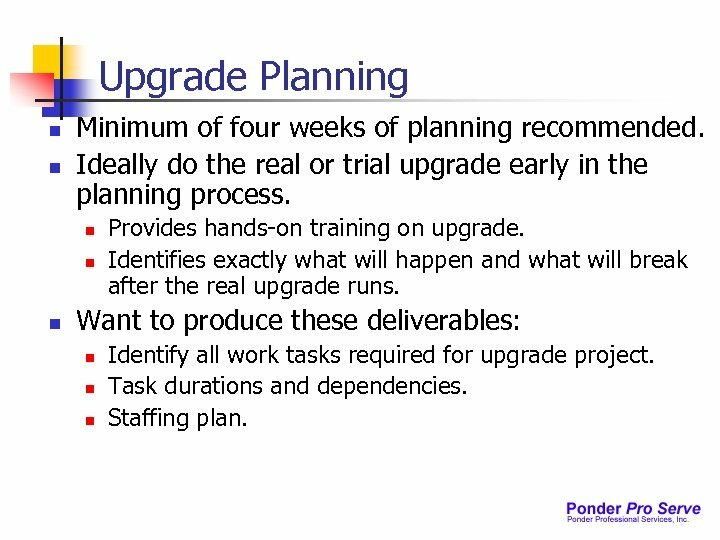 Ideally do the real or trial upgrade early in the planning process. n n n Provides hands-on training on upgrade. Identifies exactly what will happen and what will break after the real upgrade runs. Want to produce these deliverables: n n n Identify all work tasks required for upgrade project. Task durations and dependencies. Staffing plan. Development Upgrade n n Potentially very large on 6. x upgrades. For 7. x upgrades normally can be measured in weeks. Tasks vary greatly depending on a number of factors including current Siebel version, available downtime, Tools configuration, specific modules, etc. 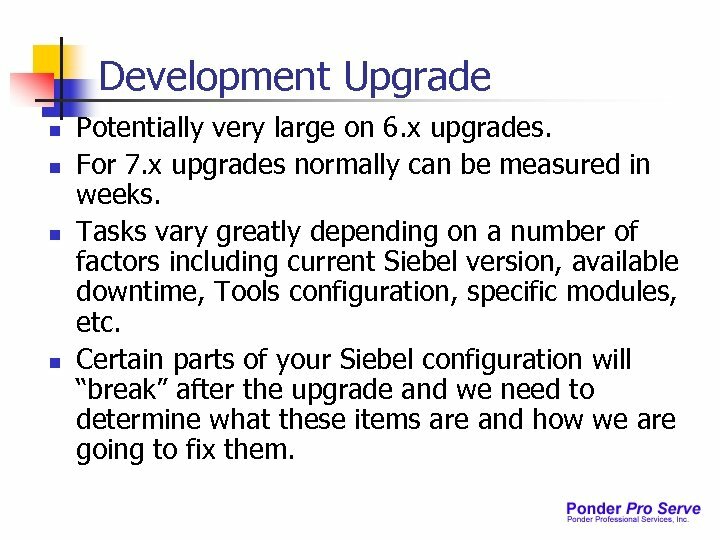 Certain parts of your Siebel configuration will “break” after the upgrade and we need to determine what these items are and how we are going to fix them. Development Upgrade Expectations n n n n n Application probably won’t launch after upgrade due to one or more configuration errors that will have to be fixed. Modified OOTB applets will be mangled. Screen/view layout will require touchups. Buscomp links and joins may require fixes. SQL errors will be seen until buscomps/tables are straightened out. 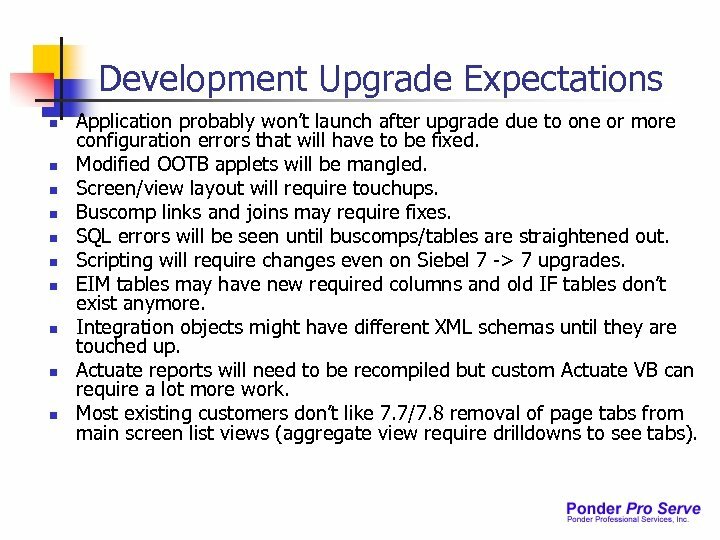 Scripting will require changes even on Siebel 7 -> 7 upgrades. EIM tables may have new required columns and old IF tables don’t exist anymore. Integration objects might have different XML schemas until they are touched up. Actuate reports will need to be recompiled but custom Actuate VB can require a lot more work. Most existing customers don’t like 7. 7/7. 8 removal of page tabs from main screen list views (aggregate view require drilldowns to see tabs). QA Testing Time n n Largest component on 7. x upgrades. Duration frequently underestimated. n n n Plan to test everything. Siebel UI, interfaces, reports, etc. 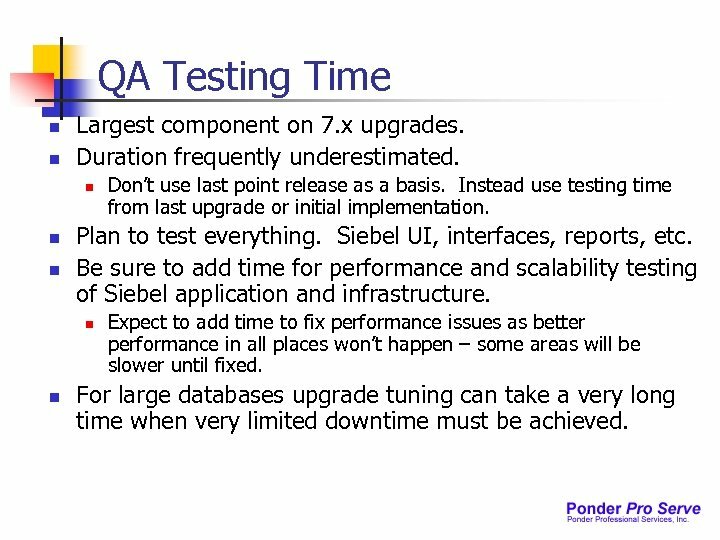 Be sure to add time for performance and scalability testing of Siebel application and infrastructure. n n Don’t use last point release as a basis. Instead use testing time from last upgrade or initial implementation. Expect to add time to fix performance issues as better performance in all places won’t happen – some areas will be slower until fixed. For large databases upgrade tuning can take a very long time when very limited downtime must be achieved. Production Upgrade and Rollout n n Allow time for several practice runs before doing the real thing. End user training and change management can be a very large task depending on number of users. Ideally would like to have some type of phased rollout but in practice this can be difficult to achieve. 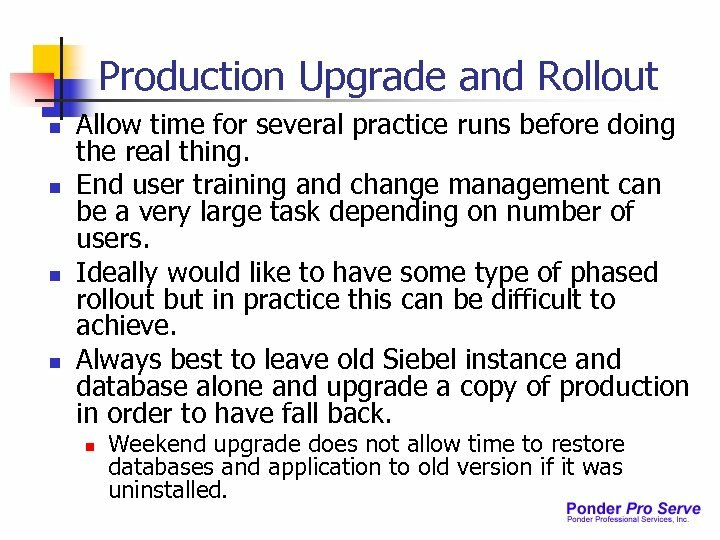 Always best to leave old Siebel instance and database alone and upgrade a copy of production in order to have fall back. n Weekend upgrade does not allow time to restore databases and application to old version if it was uninstalled. Other Tasks To Consider n n Upgrade tuning sometimes requires months for large databases with limited downtime. Implementing new modules like 7. 8 Order Management can be a very large task. 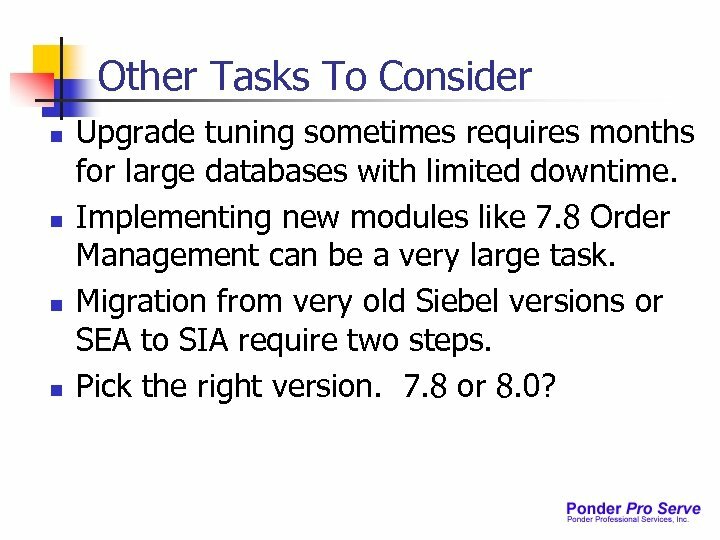 Migration from very old Siebel versions or SEA to SIA require two steps. Pick the right version. 7. 8 or 8. 0? Planning Best Practices n n n Careful planning will be required for your success. 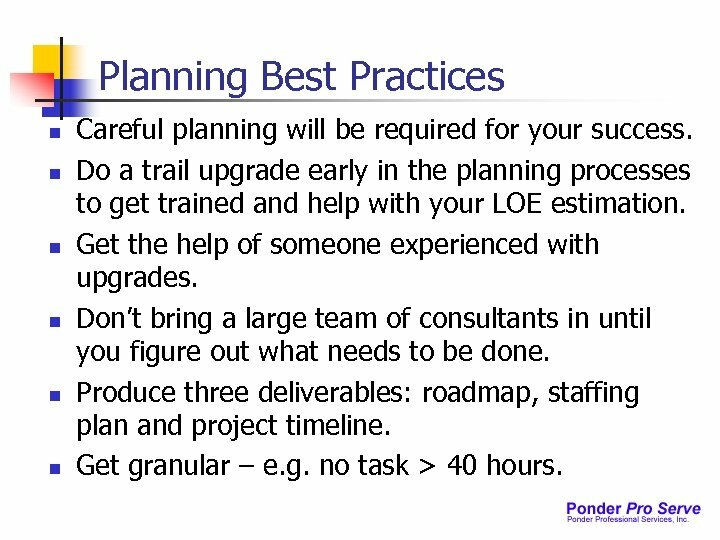 Do a trail upgrade early in the planning processes to get trained and help with your LOE estimation. Get the help of someone experienced with upgrades. Don’t bring a large team of consultants in until you figure out what needs to be done. Produce three deliverables: roadmap, staffing plan and project timeline. Get granular – e. g. no task > 40 hours. 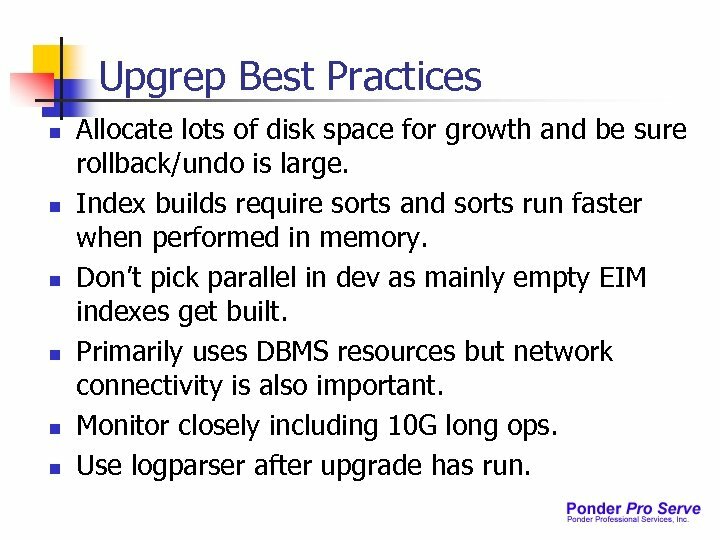 Upgrep Best Practices n n n Allocate lots of disk space for growth and be sure rollback/undo is large. Index builds require sorts and sorts run faster when performed in memory. Don’t pick parallel in dev as mainly empty EIM indexes get built. Primarily uses DBMS resources but network connectivity is also important. Monitor closely including 10 G long ops. Use logparser after upgrade has run. 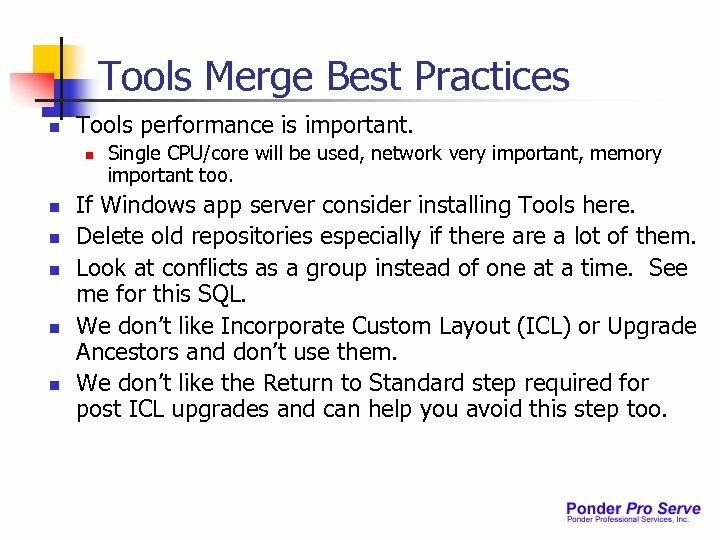 Tools Merge Best Practices n Tools performance is important. n n n Single CPU/core will be used, network very important, memory important too. If Windows app server consider installing Tools here. Delete old repositories especially if there a lot of them. Look at conflicts as a group instead of one at a time. See me for this SQL. We don’t like Incorporate Custom Layout (ICL) or Upgrade Ancestors and don’t use them. We don’t like the Return to Standard step required for post ICL upgrades and can help you avoid this step too. Dev Upgrade Best Practices n n n n Only let 1 or 2 developers in until the application launches and the main bugs are fixed. After you compile use SIEBEL_LOG_EVENTS = 4 or 5 to find and fix errors that prevent application from launching. Don’t put your srf on the server until it works. Find and fix all level 1 errors. Don’t delete your old customized repository until upgrade project is finished. Look for ways to automate repetitive tasks. Start mining the OM logs and watching for FDR files. Automated daily build and srf and browser script push to server. Twice daily for offshore model. Automated daily repository export with 30 days of history kept just in case. Single project checkout on nearly everything. Easier to start preliminary testing in dev until things get stable since migrations to QA take time. Get handle on configuration management (CM) early. Often best to divide Tools work by area (Activities, Contacts) instead of by task (UI, buscomps, scripts) if team is talented enough. Exception would be things like EIM, actuate, AM, WF policies, etc. that should be treated as specialties. QA Upgrade Best Practices n n n Current copy of production data would be ideal for Production Test sequence. Start perfecting CM migration from dev early. Continue monitoring OM logs for performance, level 1 errors, etc. Consider development shakedowns before migrating new builds. Time to start building your scripts here if you did not already start in dev. E. g. scripts to restart upgrade, parse logs, verify DBMS parms, etc. Production Upgrade Best Practices n n n Perform several practice runs exactly the same way as the real production upgrade will be performed. Don’t change things from the way you did them in dev and test. Should have detailed document that details exact steps, who will do each, duration, etc. n n n Sometimes have both a. mpp and. doc/. xls. Need to identify not only step but also any file script names including. bat files. Need to also determine how each step is to be QA’ed or assured to be accurate. Install new infrastructure hardware and upgrade a copy of productions DBMS and leave old Siebel version available on standby. Think trough shifts and who is going to work when since we can’t all go for 48 hours with zero sleep.